I thought I was going to have more time. But no. Lots of work to do, lots of fun to be had! I’ve been saving this post for about a week, and a certain sweet someone (cough-Julie-cough) has been asking about these cupcakes. I baked two types of cupcakes for a friend to take to a birthday party, and I baked an extra batch of each for another birthday party I was attending. Coincidentally, both friends were named Sara! One of the Sara’s requested White Chocolate Champagne Cupcakes, and while brainstorming a chocolate-y flavor for my second batch I remembered the Mexican Hot Chocolate Cupcake recipe in Vegan Cupcakes Take Over The World. I remembered that I made them a few years ago, they were very good, and Zoe took one home and stuck it in her refrigerator. I went out of town for about a month, and on one of my last days on vacation I received a message from Zoe in which she was describing all the amazing flavors of this cupcake that she had saved…for a month! And she sounded practically orgasmic, as she ate it. I still can’t believe the cupcake lasted that long, or how ridiculous that message was. So, I thought I should probably recreate these incredible cupcakes, and hope they came out just as good. 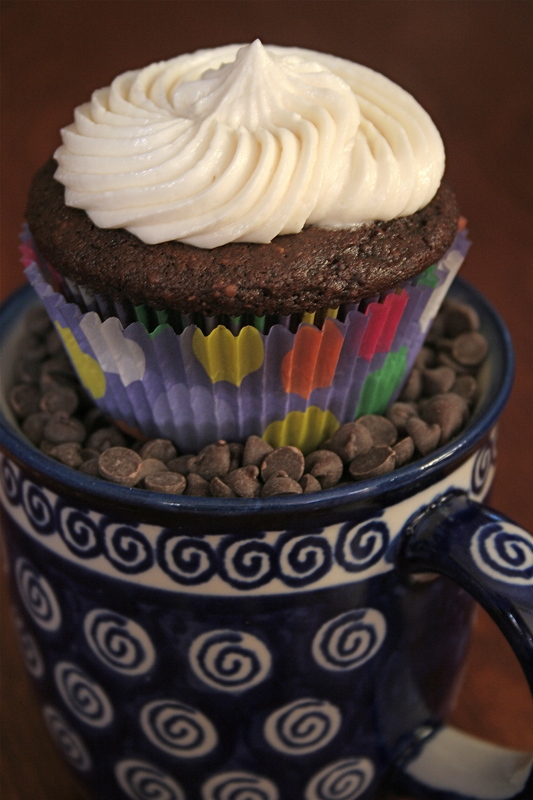 The recipe is just as it was in VCTOTW so I won’t copy it here, but dark chocolate, cinnamon, a hint of spicy cayenne pepper, crunchy cornmeal granulates, and a fluffy vanilla butter cream frosting piped on top – mmm! They were just as I remembered them, and I even gave one to Zoe! She’ll have to comment on this post in about a month and let us all know if it lived up to her memories! on the These Magical Years craft blog. You know how some foods, tastes, and smells bring back photographically-clear memories in just an instant? Baklava is a very reminiscent dessert for me. I remember watching my friend make Baklava in my kitchen a few years ago. She was using her Iranian grandmother’s recipe, which she remembered by heart. 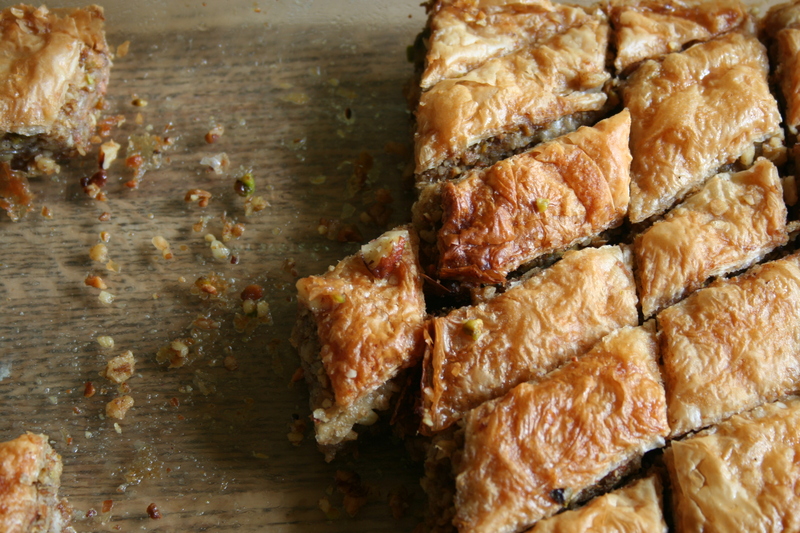 Imbued with rose water, cardamom, and pistachios, it was unlike any other Baklava I had ever tasted. With a little lemon and cinnamon in the sugar syrup, the house was filled with a warm and delightful smell. 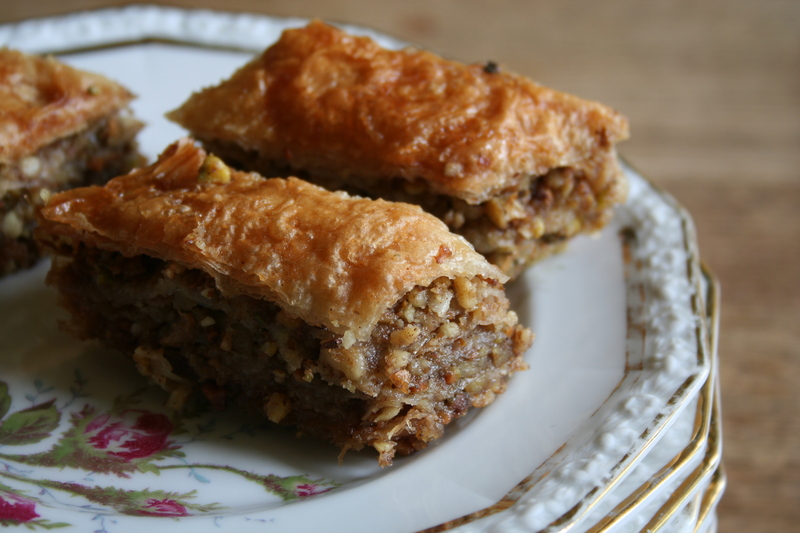 I tried to recreate this Baklava by cobbling together a few different recipes. I did not include the rose water this time, but I think that was a mistake. I added rose water to the ingredient list here, so you can use it if you like. I will be adding a little bit next time I make Baklava. First “Ingredient”: Lots of willing hands! Preheat oven to 350º F. In a saucepan over medium heat, combine 3 cups sugar, water, cinnamon sticks, lemon juice, and vanilla. Bring to a boil, then simmer for 15 minutes. The consistency should resemble a thick syrup. Slowly add the rose water at the very end, and stir in – taste and add more or less rose water depending what you like. You don’t want to boil the rose water. Set side. 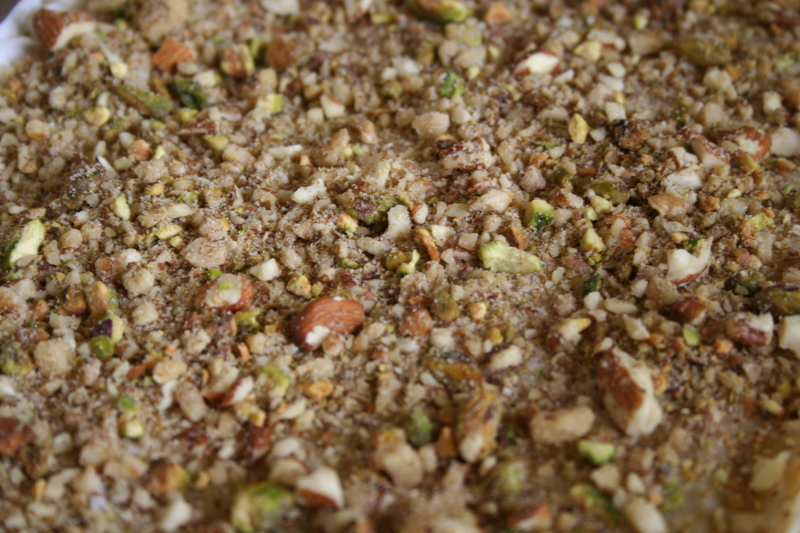 In a small bowl, combine chopped nuts, 2 tablespoons sugar, ground cinnamon, cloves, and cardamom; set aside. Brush Earth Balance on the bottom of a 9×13 inch pan. 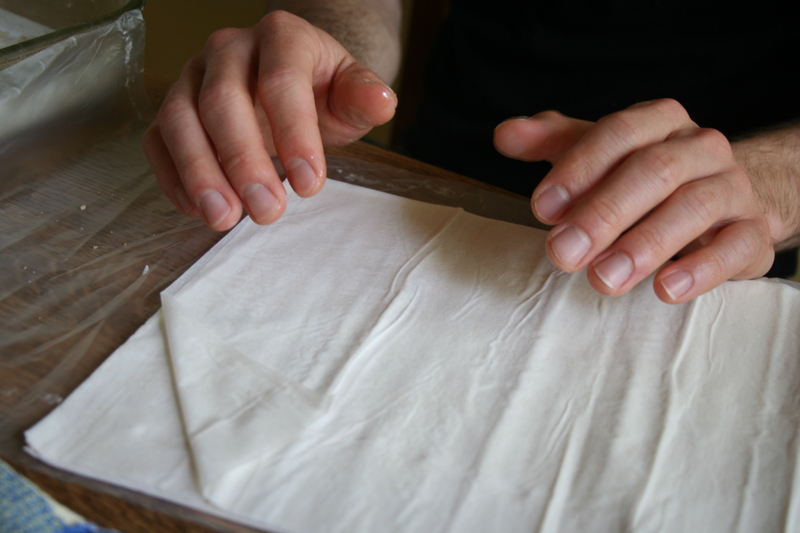 Each sheet of phyllo dough is usually twice as big as the pan, so cut each in half, making 2 sheets. Place a sheet of phyllo on bottom of pan, and brush with melted Earth Balance. Repeat process for a total of 8 sheets, buttering each. 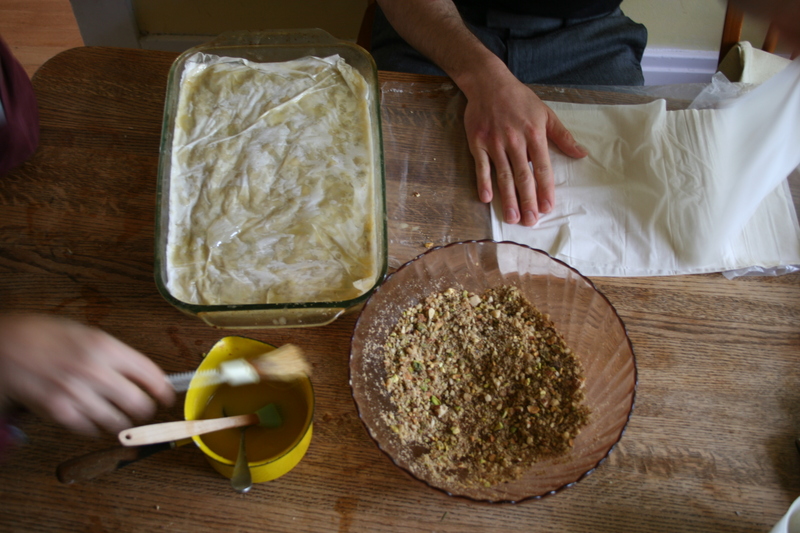 Sprinkle about 1/4 to 1/3 cup of nut mixture evenly over the phyllo, and cover with 4 more sheets, buttering each. 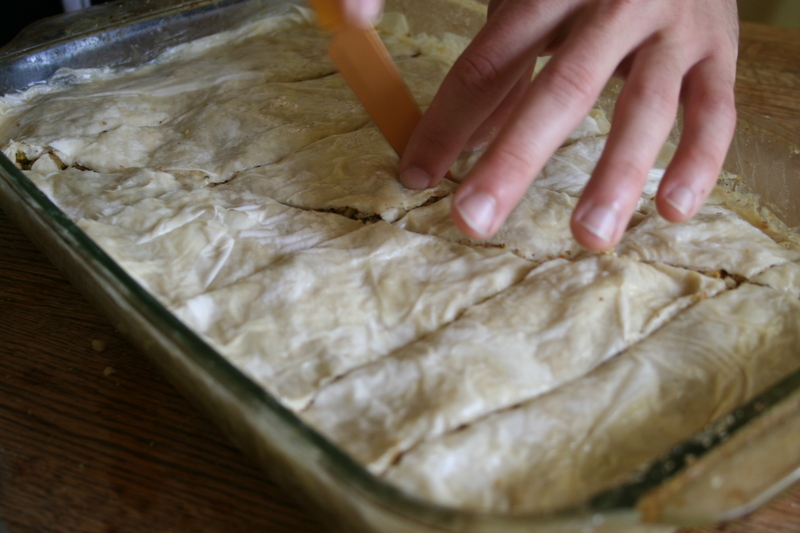 Continue sprinkling nuts after every 4 sheets of phyllo, until all but 8 sheets (4 full sheets) are used. Bake in preheated oven for 50 to 60 minutes, or until golden brown. 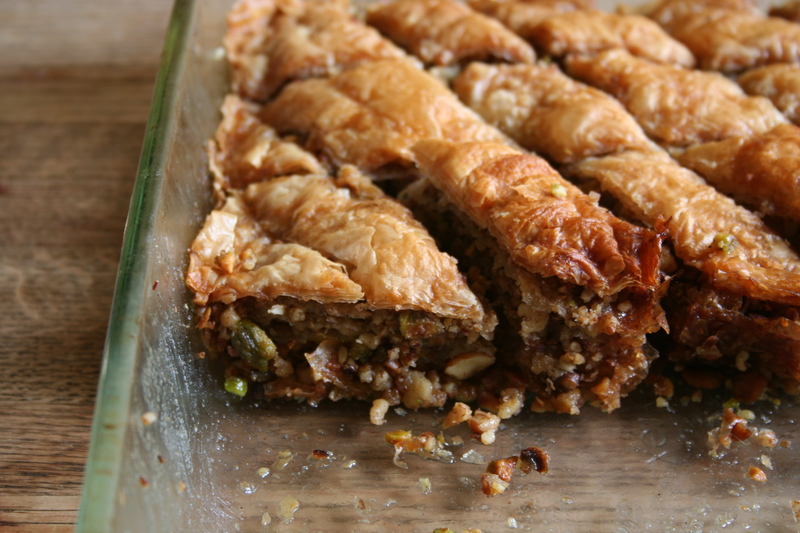 Remove from oven, and immediately pour the sugar syrup over the baklava. Allow to cool thoroughly. Cut diamonds to go all the way through, and serve. It’s springtime and that means it’s definitely time to bust out your ice cream maker. Or ice cream makers (plural). The electric ones, the hand-crank ones, even the ziploc bags filled with ice that you shake for a couple hours (or have a classroom filled with children shake and throw around the room to their utter delight). Whatever your preferred method of ice cream-making is, please heed this advice, and do it. I was inspired by Double Chocolate Straccieatella with a coconut milk base (you can find the incredible recipe here), and it lived up to, and perhaps even exceeded, my expectations. 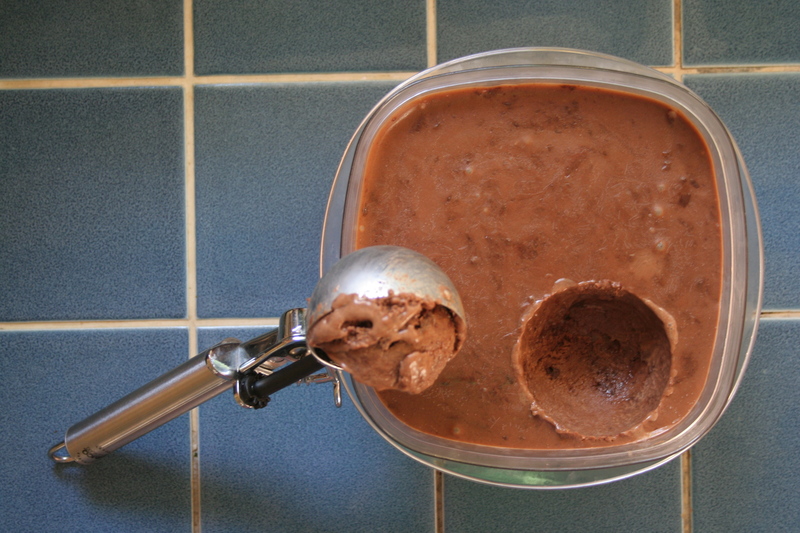 Rich and creamy, very chocolatey, lick your bowl till the bitter end, kind of ice cream. I’m leaving my ice cream maker’s freezer bowl where it belongs (in the freezer) permanently from now on. Ice cream all the time, I say! In case you couldn’t tell, this lovely Tiramisu was made for my lovely mom’s birthday celebration on Wednesday. My mom makes the best Tiramisu ever. I am not kidding around here. Literally, the best ever. It’s delicious and rich and creamy and intensely coffee-like and perfectly mushy-gushy-dense and somehow it still keeps it’s shape. So when I was brainstorming for a fabulous birthday dessert, and I thought of making Tiramisu for her, I felt immediately intimidated. My mom does NOT eat Tiramisu anywhere – at anyone else’s house or out to eat (maybe she would in Italy, I honestly don’t know about that). But, in any case, she only eats her own Tiramisu because she rightly knows that it’s definitely the best Tiramisu around. But once I knew I felt that intimidated, I knew I had to make it; I was up for the challenge. If my mom makes the best Tiramisu then I’ve learned from the best and I could make the best Tiramisu too. Right? Hopefully. I combined multiple recipes and added various ingredients and amounts and I ended up with a three-day-long project. That tasted INCREDIBLE. She took one bite…and another bite…and then she told me it was really good. And that it was as good as her’s (at least, I’d like to think I heard her say that…). It was delicious and she ate her piece and she ate some the next day and then the next day…So, I definitely say it was a big hit. Like her’s, it is also rich and dense and mushy and still holds it’s shape when you cut it. I was impressed with myself! And it tastes just like you want Tiramisu to taste! The “mascarpone” cream was certainly creamy and it thickened more than I had thought it would. Thank you arrowroot and agar agar! What would I do without you? 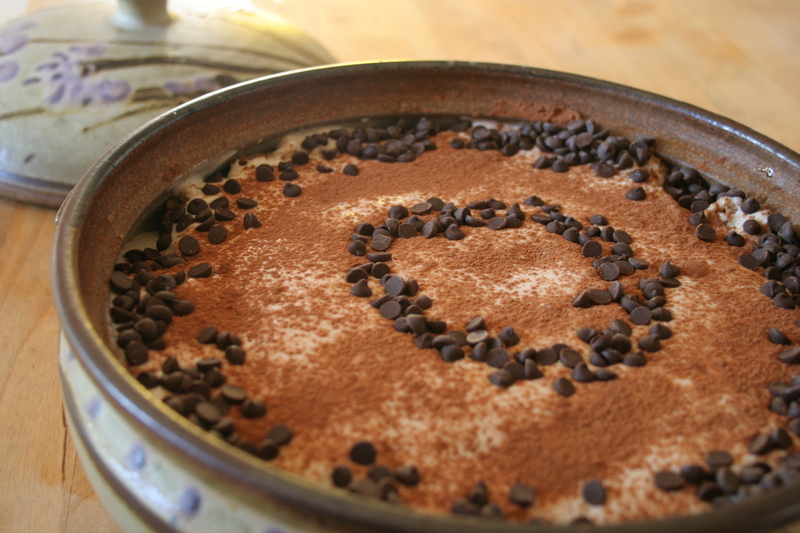 If you’re looking to wow your guests or a special someone, I suggest that you make them this Tiramisu immediately, and you will be sure to please! Happy Birthday Mom! Thanks for giving me the excuse to embark on such a fun project, and for being your fabulous self. The cake itself was a vanilla Sponge Cake from Hannah Kaminsky’s cookbook My Sweet Vegan. 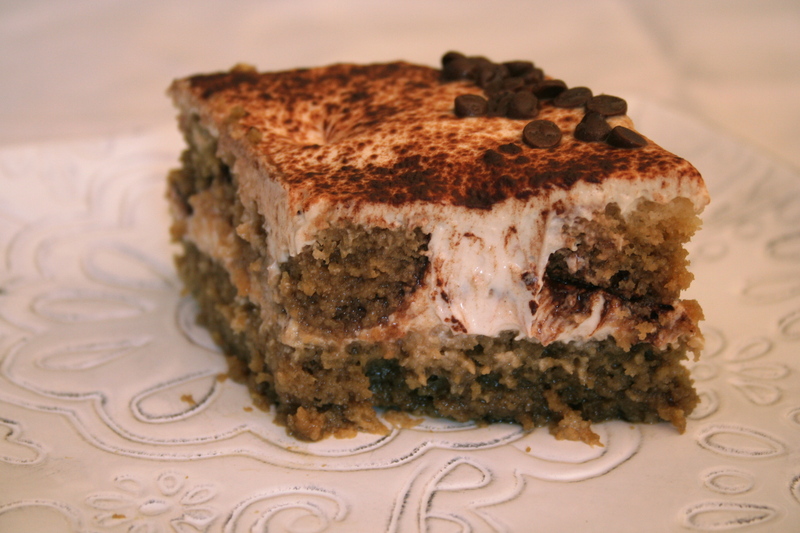 * She uses it as a base for her Green Tea Tiramisu. I made 1 ½ times the recipe for cake batter and baked it in a glass lasagna pan. It is a delicious recipe; a dense (but not heavy) golden cake that certainly holds it’s own – it’s sweet and bright flavor makes it easy to adapt since it pretty much supports any flavor you want it to. I’d say it actually brings out more complex flavors in whatever you combine it with. I’ve used it before for a birthday cake base, and I knew that it would work perfectly as Hannah originally suggested as a “Lady Finger” substitute for vegan Tiramisu. *If you don’t have Hannah’s cookbook, you could use your favorite golden vanilla cake recipe and it would be just fine. And I stress just fine. Your cake will still be delicious and hazelnutty and totally satisfying! But, if you want a drop-dead-perfect birthday-celebratory cake, go out and buy Hannah’s cookbook because this cake is GREAT and so is the whole book! You’ll be finding excuses to bake her desserts all the time! Bring the soy creamer to a boil in a small sauce pan and then dissolve the agar into it. Whisk in the arrowroot until that dissolves as well. Allow the mixture to cool to room temperature (you can put it in the fridge to speed up the process). Combine the cream/agar mix with all the other ingredients and beat in an electric mixer. When the solution is smooth, put it in the fridge to set for several hours. Combine the hot espresso and sugar and stir until the sugar is completely dissolved. Add the Kahlua and put in the fridge to cool. Cut the cake in half horizontally (then you essentially have two thinner layers). Slice these layers into 2-inch long strips that you can handle easily. Pour the Coffee Dip into a wide pan or baking sheet, and set your cake strips (“Lady Fingers”) into the mix to soak up a little. Turn the cake slices over so that both sides have soaked up the coffee/Kahlua mixture. Place a layer of the Lady Finger cake strips into the bottom of a large deep serving dish, making sure there are no empty spots. Pour half of the “mascarpone” over top of this layer. Sift cocoa powder over the “mascarpone” and sprinkle chocolate chips on top. Place another layer of the cake (dipped into the Coffee Dip again) on top, then repeat the previous “mascarpone” steps (pour on top, making sure to cover all of the cake. Sift cocoa on top, and then decorate with chocolate chips). Place the entire dish in the refrigerator and chill for at least an hour or until you are ready to serve. Nothing lures you into the kitchen like fresh baked bread. The roasting garlic, onions, and olives in these two loaves only increased the olfactory pleasure. When it was warm and fluffy, straight out of the oven, it was delicious. I was especially a fan of the olive bread, but I think this basic French Bread recipe would also be great on it’s own, without any mix-ins added. Make it how you want, get creative! *This recipe makes delicious bread. You could certainly make it and eat it as it is described here. 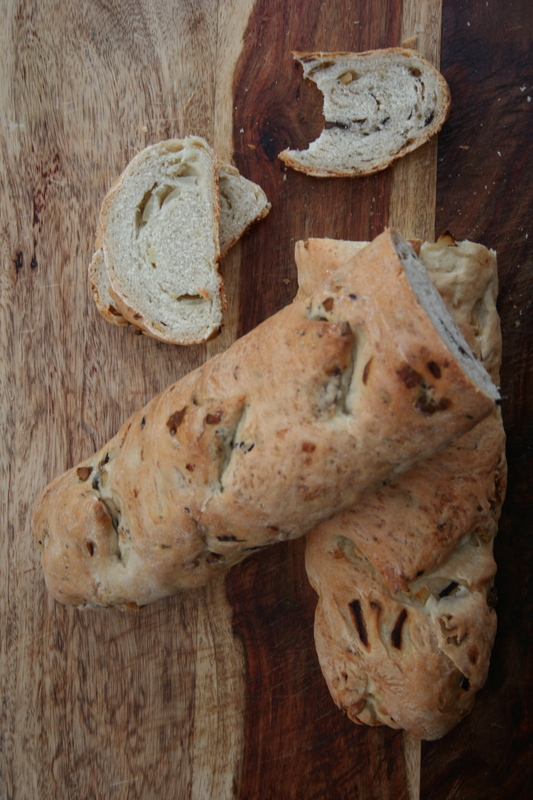 You can also add whatever other ingredients you want, for instance, one loaf I made had chopped raw onions and garlic mixed into it, and the other loaf had chopped olives (a mixed variety of green and black) folded into the dough. In a large bowl, combine 2 cups flour, yeast and salt. Stir in 2 cups warm water, and beat until well blended using a stand mixer with a dough hook attachment, or a wooden spoon. 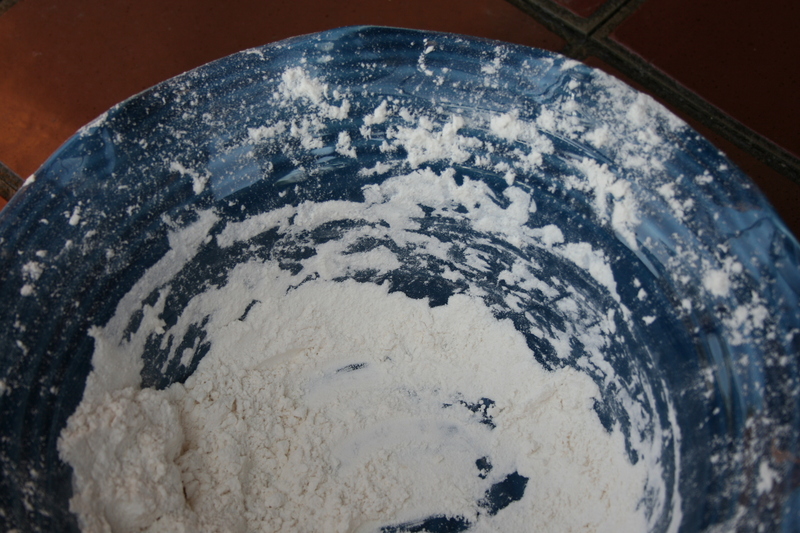 Then, using a wooden spoon or your hands, stir in as much of the remaining flour as you can. On a lightly floured surface, knead in enough flour to make a stiff dough that is smooth and elastic. Knead for about 8 to 10 minutes total. If you want to add any extra “flavor” ingredients to your dough, this is the time to do it. If you want two different flavors of your bread, then divide your dough in half, and knead the mix-in ingredients into the dough. Shape into a ball. Place dough in a greased bowl, and turn once. Cover, and let rise in a warm place until doubled. Punch dough down, and divide in half (unless you already did this). Turn out onto a lightly floured surface. Cover, and let rest for 10 minutes. Roll each half into large rectangle. Roll up, starting from a long side. 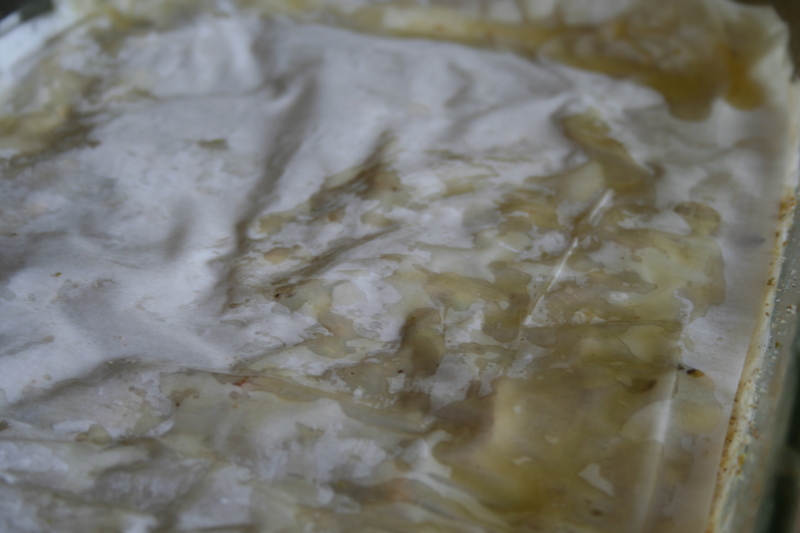 Moisten edge with water and seal. Taper ends. Grease a large baking sheet. Sprinkle with cornmeal. Place loaves, seam side down, on the prepared baking sheet. Brush on some of the water. Cover with a damp cloth. Let rise until nearly doubled, 35 to 40 minutes. 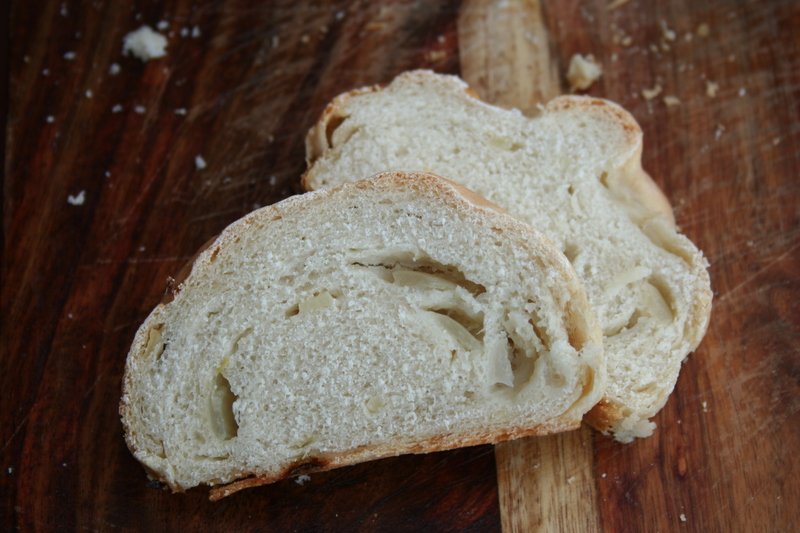 With a very sharp knife, make 3 or 4 diagonal cuts about 1/4 inch deep across top of each loaf. Bake in a preheated 375° F oven for 20 minutes. Brush again with water. Bake for an additional 15 to 20 minutes, or until bread tests done (you can tell if the bread is done by lifting it off the pan and tapping the bottom – it should sound hollow). If necessary, cover loosely with foil to prevent over browning. Remove from baking sheet, and cool on a wire rack. 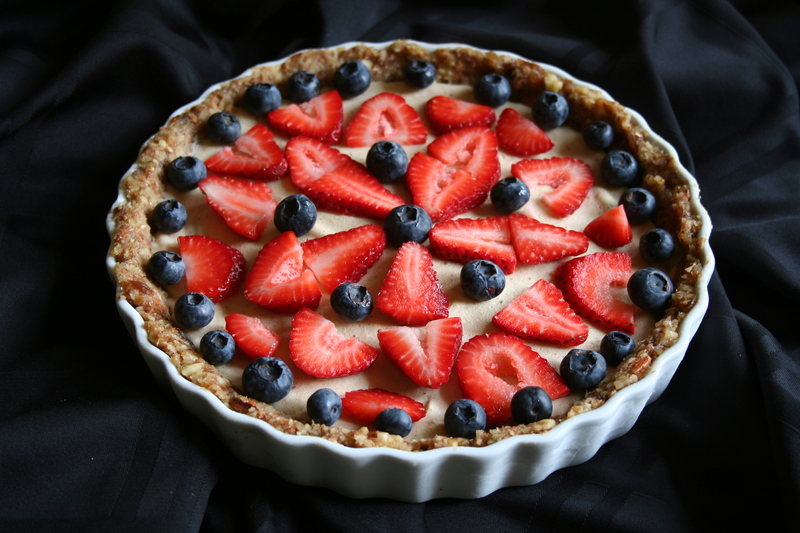 It’s been a year since I made this delectable dessert; I know because last year I made it for Passover and this year I’ve done it again! This frozen treat is surprisingly sweet and you won’t feel like you need anything with processed sugar or even “real” ice cream to compete! The healthy sweetness and creamy texture of the frozen blended banana will satisfy any sweet tooth, I promise. And, if you need a chocolate fix, you can always melt down some dark or semi-sweet chocolate and drizzle it on top – I bet no one would mind. You can find my recipe from last year here; the only changes I made this year were to add blueberries on top and leave out the lemon decoration. 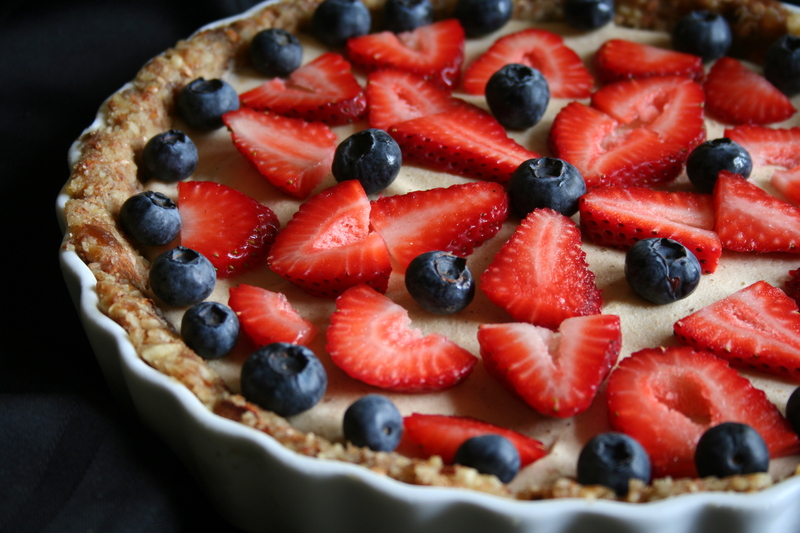 The strawberries and blueberries taste great with the banana, almonds, and dates, and they add a different, juicy texture to the top of the pie. 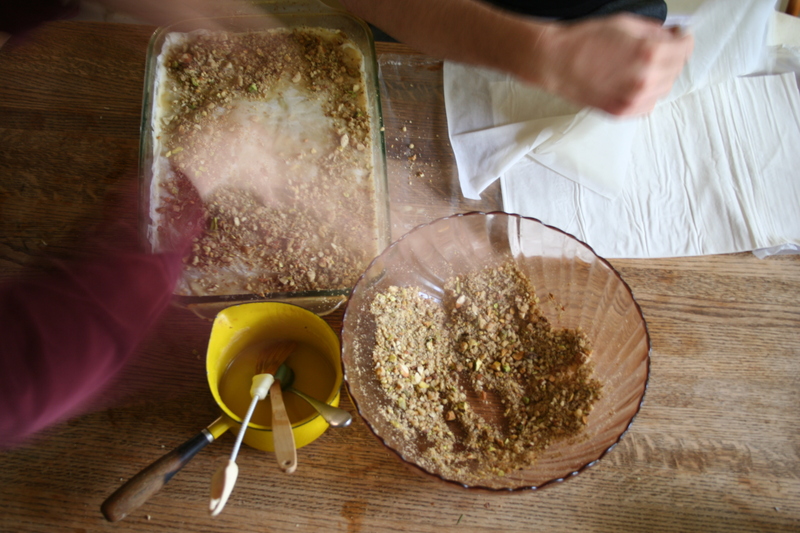 Here’s what the almond-date crust looks like before adding any filling into the pie shell. 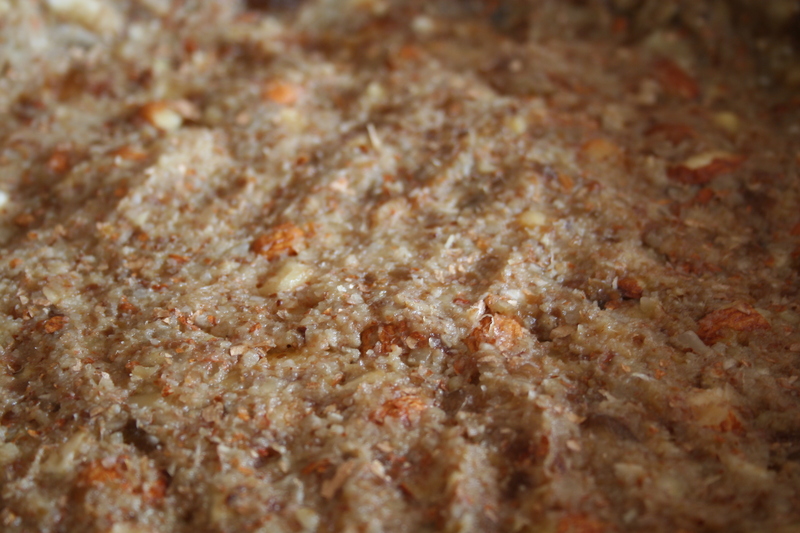 I like the uneven texture, however, you can grind your nuts into a finer and more consistent texture if you want to.